Christian Benazeth was born in 1947 in the South of France to a fishing and hunting family. In the early 1970s he combined game fishing and safaris in East Africa, where he ran Somalia's Yamani Safari Camp. 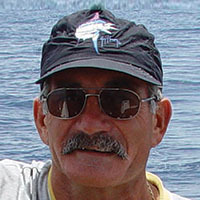 In the 1980s, encouraged by West Africa sport fishing pioneer Pierre Dupuy, he ran fishing camps and served as IGFA Representative from 1987 to 1998 in Mauritania and Senegal. Fishing with angler Jean Paul Richard and others, Benazeth participated as angler and captain in more than 20 IGFA world records on light tackle and fly. In Africa's Ivory Coast, Benazeth operated a charter boat concentrating on blue marlin-- often catching fish of more than 1,000 pounds. Today he fishes for blue and white marlin in West African countries from Equatorial Guinea to Morocco with Laurent Sahyoun-- one of the best anglers of this generation. For the past 30 years Benazeth has promoted catch-and-release and other fisheries conservation measures to local anglers, mates and other captains. For the second year in a row, he was honored by The Billfish Foundation as the Top Tagging Captain for Atlantic white marlin.